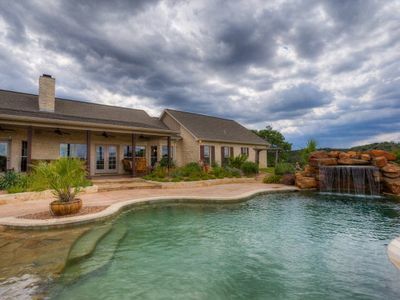 This exquisite homestead is nestled in the heart of the Texas Hill Country! 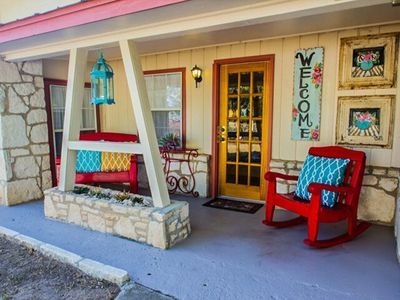 Located just 30 scenic miles from Fredericksburg, in nearby Historic Kerrville, Texas! 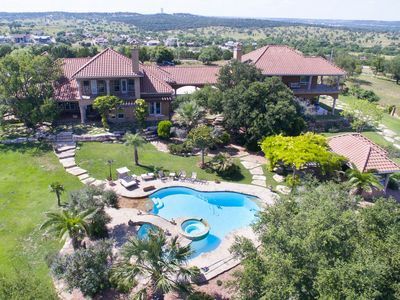 Privately gated on 18 acres. 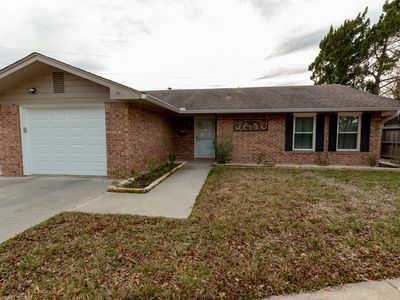 Foyer opens into large great room w/vaulted ceilings and limestone wood burning fireplace. 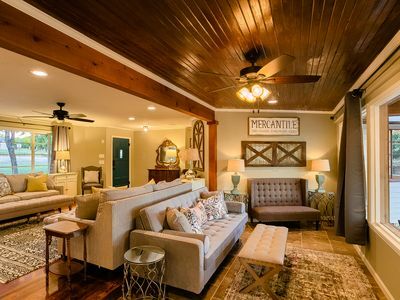 Large master bedroom with heavenly king size bed and french doors opening to covered patio and pergola overlooking stunning pool and outdoor fireplace. 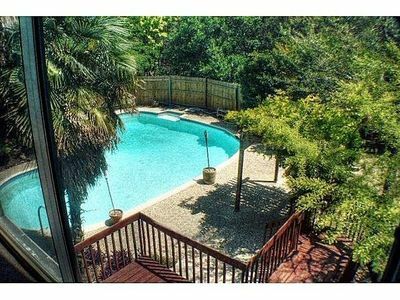 Pool boasts gorgeous waterfall and cascading infinity edge with a beach entrance. Fantastic furniture and artwork throughout. Gourmet custom kitchen with sub-zero refrigerator and commercial Viking stainless appliances. Custom alder cabinetry, granite bar, prep sink. Surround sound throughout home and back patio. 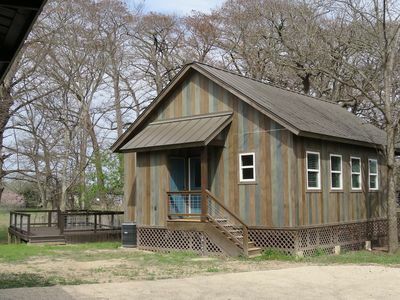 Split floorplan, secondary bedrooms have Jack & Jill baths with copper sinks. Private fourth bedroom has private bath. Beautiful hickory wood floors and stained concrete throughout. 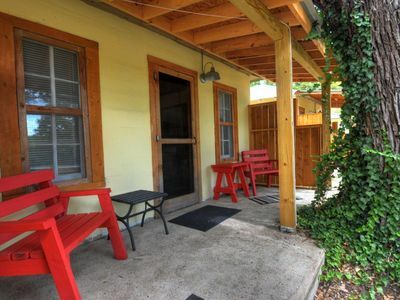 Sleeps 10 comfortably in beds, and an additional 4 with use of sleeper sofa and air mattress. Spacious parking available. Small Pets allowed upon approval and additional deposit. 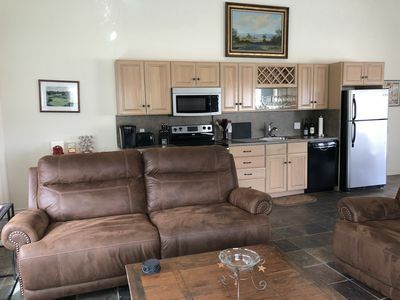 Huge Laundry room with front-load washer and dryer, laundry sink, full size beverage refrigerator. 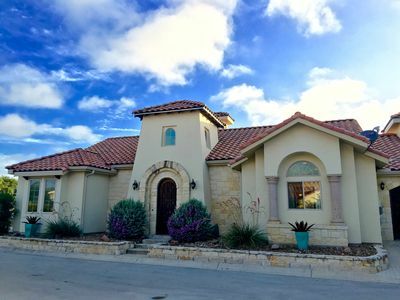 Luna Vista is located less than 5 minutes from Historic Downtown Kerrville, with shops, galleries, fine dining, theaters and more! The Louis Hayes Park downtown stretches the beautiful Guadalupe river and includes a splash park, outdoor amphitheater for festivals & concerts, dog park and the newly constructed river trail! 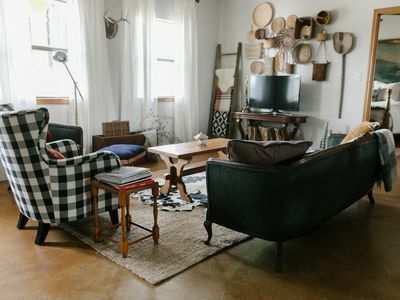 Make sure to visit the Museum of Western Art, Cailloux Theater, Schreiner Mansion, along with our amazing string of shops and bakeries downtown while staying at Luna Vista! Attention WINE LOVERS! 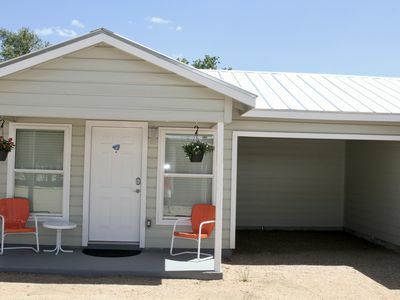 Luna Vista is also located only 25 minutes from the famous Frederickburg, Texas! 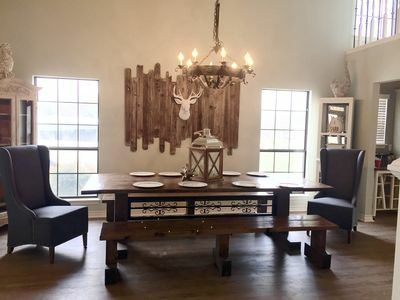 Take the scenic drive down beautiful Highway 16 to enjoy amazing downtown shops and tour the world-famous Fredericksburg Wine Road 290! This historic German town boasts the National Museum of the Pacific War, Wildseed Farms, Rockbox Theater, and the monthly Trade Days! 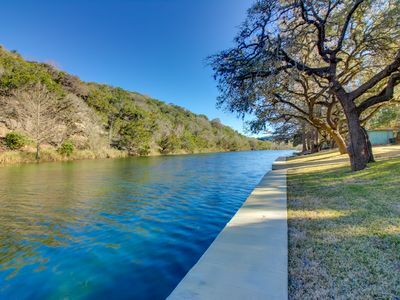 You'll have plenty to do and see while enjoying the beautiful Texas Hill Country! Book your stay with us today! THE POOL WILL NOT BE HEATED unless arranged 7 days prior to your stay. Once ordered, your propane will be filled and heater turned on prior to your check-in, as the pool takes up to 12 hours to heat. 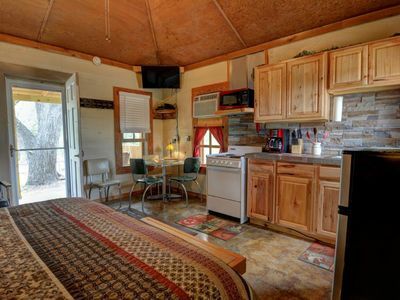 There will be an additional $500 charge to your booking (which reimburses for the propane fill), Your heating charge includes 1 full tank that can last from 3 to 5 days, depending on the weather. If you are staying longer and use up the propane, additional propane may be ordered. If you do not arrange for the pool to be heated PRIOR to your stay, we will have to schedule the propane company to fill at their earliest convenience once you've requested it. You may have to wait 24 to 48 hours for the fill. Because the pool is outdoors and uncovered, rain and cold weather/wind can affect the heater's ability to heat and maintain desired temperature. This may also use more propane than usual. We do not recommend using the pool heater during rainy or very cold weather conditions. Considering these factors, guest discretion is advised. If propane is left in the tank at check-out, or guests decide to not use their propane for any reason, no refunds will be given for unused propane. Refunds will not be given if pool heater does not heat to guest satisfaction, unless a system failure or malfunction has been determined by our professional pool maintenance company. If the system stops heating for a period of time, due to guests’ misuse or otherwise, we will attempt to have the system evaluated or repaired as quickly as possible, within normal business hours. POOL EQUIPMENT BEHIND OUTDOOR FIREPLACE IS NOT TO BE ACCESSED OR TAMPERED WITH UNDER ANY CIRCUMSTANCES. *** Rates are based on the number of guests staying at property. 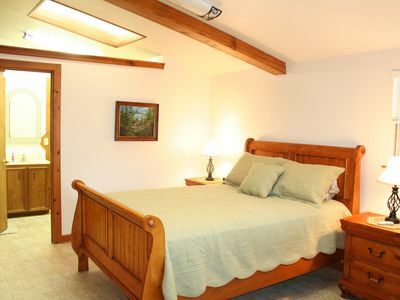 Children of all ages count as a guest, and will be charged the additional guest fee. (Children under 2 years of age may not be charged if your party is at least 10 adults, at the manager's discretion. Please indicate if you have children under the age of 2 and have an adult booking party of 10 or more). Please see our RATES section for a detailed description prior to booking. Guest counts must be indicated prior to booking and paying. If someone is added to your booking party, you must notify us 7 days prior to your stay. No additional guests fees will be refunded if any guests cancel their plans within 30 days of your stay. 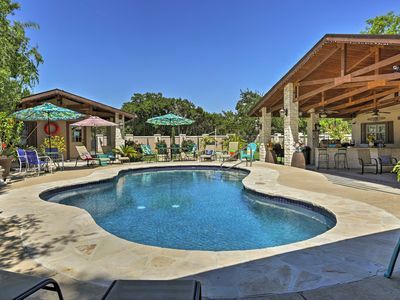 Peaceful Kerrville House w/Private Pool & Hot Tub! 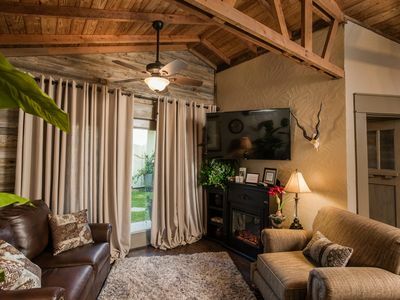 Kerrville River House Retreat! 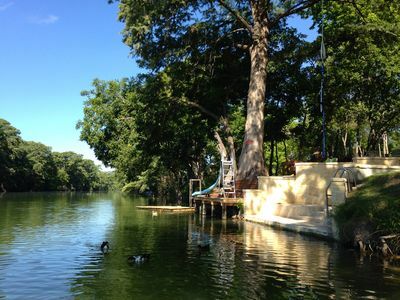 Right on the Guadalupe River! Steps to the water! 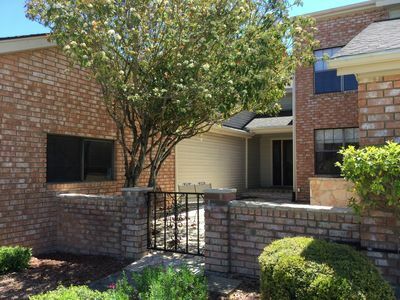 Deluxe vacation home overlooking golf course with pool/spa, dog-friendly! 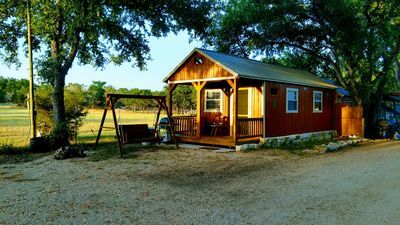 A Little House Nestled Near the Guadalupe River and Texas Vineyards.